Some happy users lauded the stylish design of the Asics Tarthezeal 6. According to several runners, the shoe is comfortable. A few purchasers said that the Tarthezeal 6 feels fast and light. Several testers admired the bouncy feel of the shoe's cushioning. Based on some user reviews, the shoe runs true to size. The shoe is more expensive compared to other road running shoes. A few users said that the Tarthezeal 6 is not ideal for wide-footed runners. The Asics Tarthezeal 6 is a stylish running shoe designed for road running. The shoe gained positive reviews from various runners who were satisfied with its comfortable fit, lightweight design, and bouncy ride. Although some have issues with the shoe's price and width, it is still a running shoe that most wearers considered to be worth the purchase. I started my running training plan last summer, and finish my first half marathon last November. Compared to other Runrepeat experts, my running history is relatively short. It’s interesting that as a newbie, I started my running journey from this pair of shoes which lacks cushioning compared to other shoes that fits for newbies. The catalog of Asics in the Western world is very different from Asia. For example, we Asians have Tartherzeal and Skysensor on the catalog, while we don’t have Gel-Hyperspeed. So, I’m not surprised that there isn’t enough information about Tartherzeal series on Runrepeat website. The cushioning of Tartherzeal 6 is not much - 1cm on the forefoot, 2cm on the heel. My Asics Gel Nimbus 20 is about two times thicker, and I don’t think anyone who has run in these shoes will regard it as maximalist shoes. From experience I had with these shoes, the new midsole (Flytefoam) is bouncier than the midsole Asics used before. I’ve worn Asics shoes like Nimbus 18, but I didn't regard myself as a runner that time, it’s just a pair of sneakers I choose to wear. The Flytefoam midsole is bouncier than Speva, and absorb the impact of my feet less. The result of changing midsole is very apparent, at least for me. I also have a pair of Adidas Adizero Boston 6, and I don’t think Flytefoam is bouncier than Adidas boost. Its technology makes you feel the road, but retain bounce and cushioning. If I compare the midsole of Boston 6 and Tartherzeal 6, the midsole of Boston 6 makes my feet feel uneasy after training. Also, even if the midsole of Tartherzeal is thinner, my feet never feel pain after running in Tartherzeal 6. The drop is 10mm (according to Asics), but I haven't wear running shoes which drop below 10mm, so I don’t have anything to compare. One of the specialties about Tartherzeal 6 is its outsole. The forefoot of Tartherzeal is composed of many little bulges that seem like "Tigers claws," and the grip on a wet surface is incredible. I often train in bad weather, and any surface you can imagine - wet, asphalt road or cement, the outsole never disappoint me. When I run faster (some tempo run), the outsole offers great grip and stability. If the tiger's claw has any defectiveness, it will be the speed of abrasion. The mid-foot part wears faster than the toe and other forefoot parts. The outsole of the heel is AHARPLUS which is often used on other Asics shoes. After 350km, it shows a minimal abrasion. I guess it will last longer, could be a thousand kilometers. Asics uses the technology called "Adapt Mesh" on these shoes, which provides the breathability and soft enough to pack your feet. The engineered mesh on Tartherzeal 6 seems to be microsuede, but you can clean it with dishwashing liquid (unlike real suede), easy to maintain the shoes. The very breathable upper mesh is good when you want to clean your running shoes. When you clean your shoes, it will dry up after you put your shoes in a spin dryer. As you can see, I bought a pair of white Tartherzeal 6, and the logo of Asics Tiger’s Claw (they really love tiger, huh?) is on the side of this shoes, and offer some supporting force from the two sides of shoes. Normally, the width of Asics flagship model has 3 kinds - D/2E/4E. I don’t know why Asics don’t have their flagship as Tartherzeal racing flat model 4E width, but I never feel troubled about that. I wear Tartherzeal 6 in D width, same as Nimbus 20. I wonder if Asics has all their running shoes the same. I remember they have a wider shoe options years before. The shoelace of Tartherzeal 6 is made of nylon that can be pulled to extend a little, and the Chinese character "Tiger run" is on the tongue of shoes that's the reason this shoe has the nickname "Tiger run." The insole of Tartherzeal 6 is made of Speva and can be bought in the Asics store. I’m sure the quality of insole is superior because my insole of Tartherzeal 6 isn't changed after 350km running, and I ’ll give speculation on this insole when I close to retire my shoes. For me, Tartherzeal 6 is a typical racing flat and not suitable for beginners. When I start running with these shoes, for me, the flexibility, and lightweight didn't bother much. Remember, the training arrangement is up to you, not the shoes. I seldom use Tartherzeal to do long runs (less than 16km). Tartherzeal isn’t fit for everyone, but it still a pair of good shoes on every aspect. The Asics Tartherzeal 6 is a running shoe that’s designed for those who have neutral pronation. It makes use of mesh that’s capable of adapting to the shape and motion of the wearer’s foot. Ecsaine overlays are stitched onto the mesh, making the cover system more supportive and intact. FlyteFoam is foam compound that offers reactive steps and springy liftoffs. It runs the entire length of this running shoe. A plastic unit called Propulsion Trusstic is plated between the midsole and outsole. It acts as the tendons and muscles of the foot-pad, fundamentally assisting the runner in achieving a more enabled toe-off. The outsole makes use of two technologies to deliver protection and traction over the surfaces. The first one is located in the forefoot section, and it offers both grip and shielding while also reducing the weight of the platform. The rear section features AHAR or Asics High-Abrasion Rubber. The Asics Tartherzeal 6 was designed using the standard measurements. It adheres to the usual choices of runners when it comes to the sizing scheme. The available width for the women’s version is B – Medium. The men’s iteration has the D – Medium profile. This Asics running footwear uses a racing last, which is a narrower base that is shaped like the human foot. This design is most prominent in close-to-the-ground footwear with speed and propulsive power in mind. The forefoot section of the Asics Tartherzeal 6’s outsole makes use of the PU DuoSole, which is a set of rubber gripping lugs that are affixed to a polyurethane base. This design is helpful for those who want to benefit from a flexible yet grippy and durable external layer. AHAR or Asics High Abrasion Rubber is the material that’s used in the heel section. Its durable nature allows it to shield the foam from impact shock and grazes. This outsole material is also present in other popular Asics running shoes like the Asics Patriot 10 and GT 2000 7. The decoupled platform isolates the landing shock to the area that is in contact, leaving the rest of the platform free from any impact discomfort. Flex grooves permit the runner to bend the foot and its joints with ease. These shallow outsole trenches are particularly helpful during the toe-off, which is the part in the gait cycle that requires maximum foot flexibility. The Asics Tartherzeal 6 makes use of the FlyteFoam technology, which is a full-length foam unit that is responsible for carrying the foot throughout the running session. It’s created using responsive and bouncy foam, as well as organic super-fibers that prevent sagging or breaking down. The Propulsion Trusstic is a plastic layer that’s placed between the outsole and midsole. Part of it can be seen from the bottom of the shoe. Its purpose is to act as a foundation for the underside of the foot, supporting it and keeping it safe from discomfort. It also serves as the extension of the tendons and muscles, enabling more oomph to the liftoff through its propulsive purpose. Adapt Mesh is a breathable and flexible material that serves as the upper unit of the Asics Tartherzeal 6. It conforms to the shape of the wearer’s foot, keeping it secure in an unrestricted wrap. The midfoot section has a more open-weave design to permit the flow of air into the foot-chamber. Interwoven fibers bunch together to act like strands that hug the sides of the foot. Ecsaine overlays are stitched onto the mesh. These durable yet elastic add-ons provide structure to the façade. 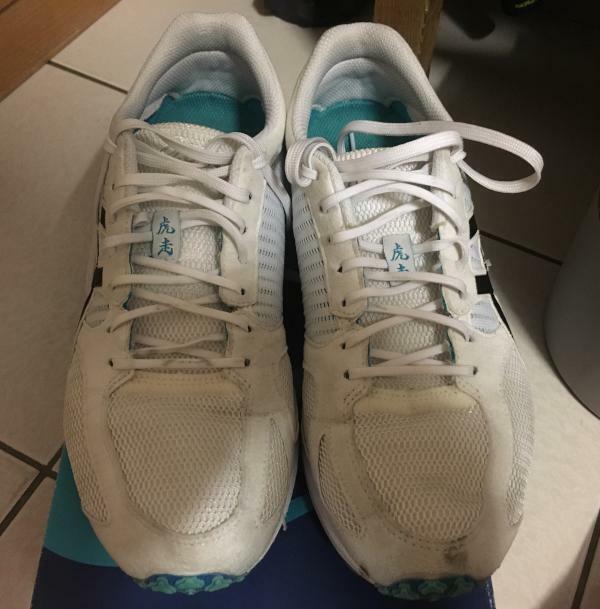 They also make sure to adapt to the tightening or loosening of the lacing system since they also extend to the instep to operate as connective tissues to the shoestrings. The lightly padded tongue and collar cushion the upper portions of the foot while also preventing in-shoe wobbling and accidental shoe-removals.